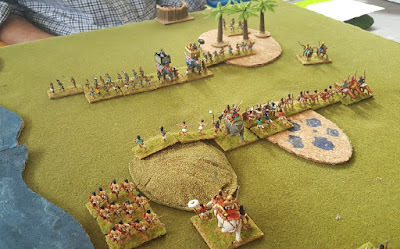 So this is another pairs format ... historical armies but open choice of terrain. 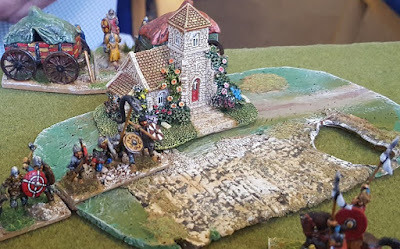 Having used my 'work in progress' Byzantines at the Midland Open, I decided to carry on the good work and dust off my generic Gothic collection to see if there was a Lombard-ish option. I think it passed muster. The pairing is based on the wars of the Lombard Dukes in Northern and Central Italy in the 570s and 80s ... notionally Duke Faroald of Spoleto and his historical adversary, the Romanised German Droctulfo. Ravenna in their sights. 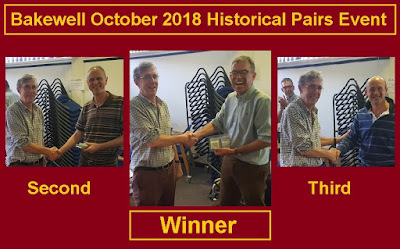 The pair gave some nice games, and for a change, I won my 'home' games. Of course, that risks it looking like I know what I'm doing. 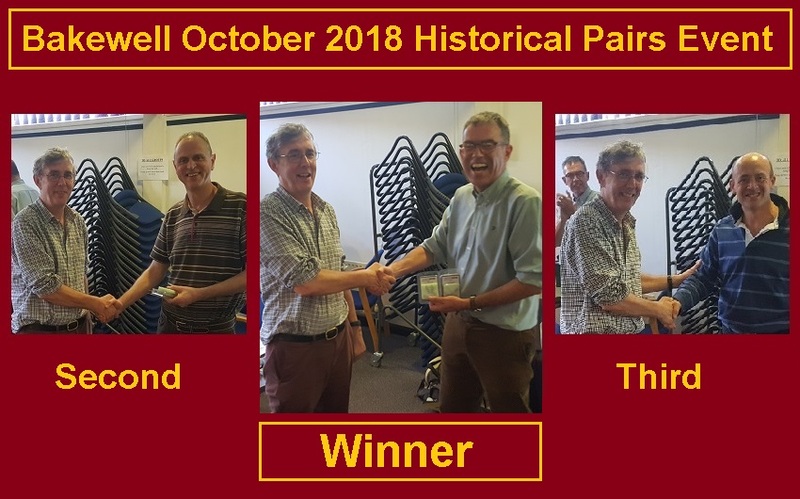 This gave me something of a chance - Romans vs Spartacus is a pair I have in my own collection (and took to Alton I think) ... so I know it quite well. Also I think Nick was uncommonly generous to the Romans in letting them have an elephant. This was Simon's set up. I always seem to mishandle these elephant armies. And did so again. I made a mess of this one too ... being too 'speculative' in my attacks - pushing the pace and paying the price. Hmmm. So, what happened ... well we all had a good time and ... Richard Pulley won with his match: Nubians I/3 and Libyans I/7a. 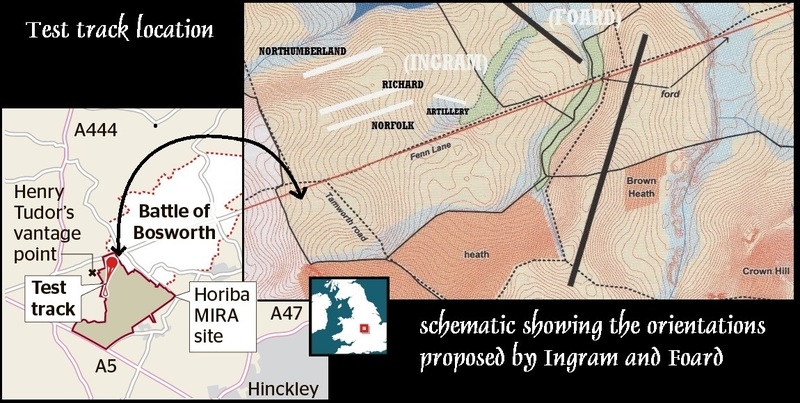 Earlier this year, the Planning Committee of Hinckley-Bosworth Borough Council decided, in the face of much opposition, to allow the Japanese multinational, Horiba-Mira, to build a test track for autonomous vehicles (driverless cars) on the western end of Bosworth battlefield. Inside the perimeter of the (Historic England) registered battlefield, where development should only be permitted where the case is deemed wholly exceptional. 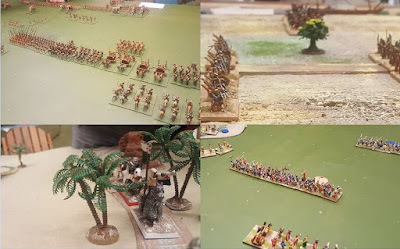 Why should historical wargamers, historians and military hobbyists care? What's it got to do with us? And regards the heritage site, itself, it's just a field, right? And anyway, they move battlefields around these days, don't they? ... and this is just another theory. Nobody knows where these battles were fought, and one field is pretty much the same as any other? Well, no ... that's pretty much all wrong. 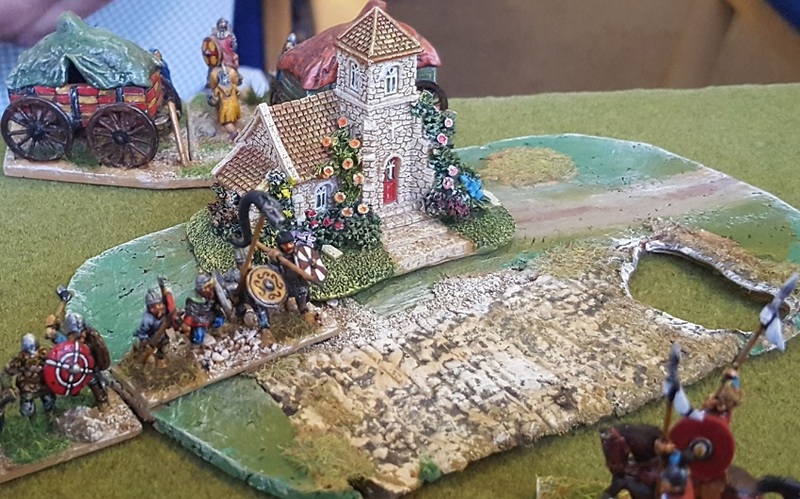 And you wouldn't want to refight a battle like Bosworth, which was fought on the flat and fight it on top of hill, would you? Factoring in all sorts of details that weren't part of the battle. OK ... battlefields being moved does happen, and where some were fought, we really don't know. Our Victorian and antiquarian forefathers were pretty lax about location, but they were quite up on pageantry and tourism, so quite a lot of our identification and memorialisation has been inherited from a time when the apparatus was lacking and speculation was commonly turned to as a good alternative to research. Archaeology, in particular, was hardly adding to the picture. So they created a fairly complete array of historical battlefields - and got a number of them in the wrong place*. Palpably. 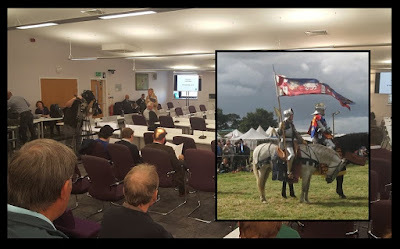 Bosworth is one such, consequently, almost everything published on the battle of Bosworth prior to the last 5 years or so is completely out-of-date. Previous generations misread the identification on an early map and placed the battle in an unlikely position on the top of a hill that does not match the contemporary accounts. Fanciful theories were then constructed - synthetic history, if you like - to make the narratives fit the wrong location. An awful lot of work ... indeed, in some senses also, reputation, went into these fictional battlefields. Despite which, many were sceptical ... 'this' battle of Bosworth was not a good fit, and some aspects were unconvincingly convoluted. 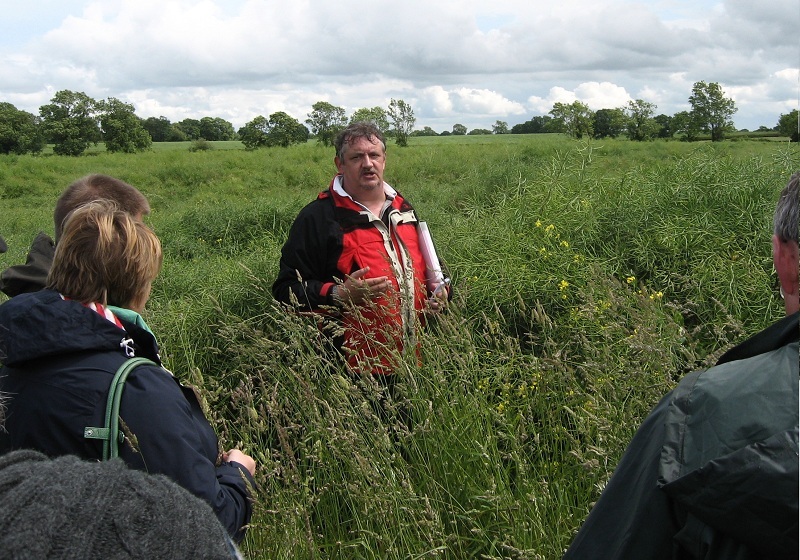 Then, 10 years ago, the Battlefields Trust and Leicestershire County Council brokered an archaeological survey to find the historical battlefield. 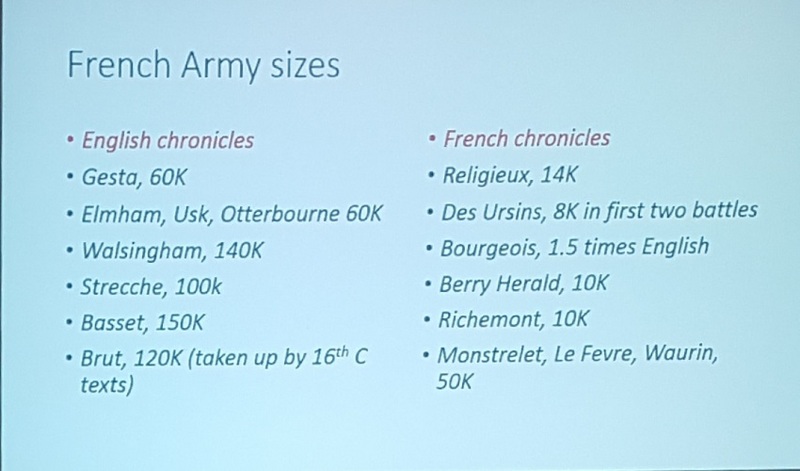 A lot of investigation was geared to the historical theories - so proved utterly futile ... but at the eleventh hour, the search turned towards areas more likely from contemporary accounts and place names. The battlefield was found. 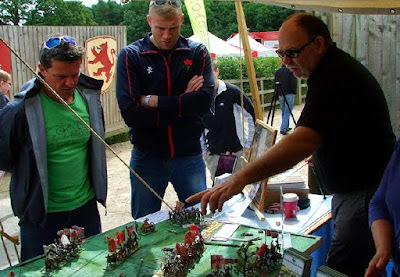 Mike Ingram's 2012 'Battle Story' book was the first to incorporate the new evidence ... since when the Visitor Centre itself has embraced the new location, Anne Curry and Glenn Foard (the archaeologist who led the work) have published the full account, and many historians, Chris Skidmore MP as an example, have revised their accounts. But many have not. Even Wikipedia still gives the old maps and interpretations top billing and makes the new evidence and added section. Only one of the maps I found on an image search was correct. All the wargame guides are wrong. None of them have been revised or withdrawn and, to the best of my knowledge, none of them have a little slip of paper in them advising the reader that 'this interpretation is almost certainly wrong'. Bosworth is an industry and a lot of people have money, stock and reputation committed to it. And all of this has made the battlefield harder to protect ... at the planning meeting I had to listen to 'experts' (archaeologists) advising the committee that the portion being lost was only a small fraction of the battlefield, just at the edge and probably not important. Indeed, that, countering the submission by the Battlefields Trust, 'there are other theories'. It reminded me of the show I was at in 2013 where Bosworth was being refought on top of a miniature Ambion Hill ... 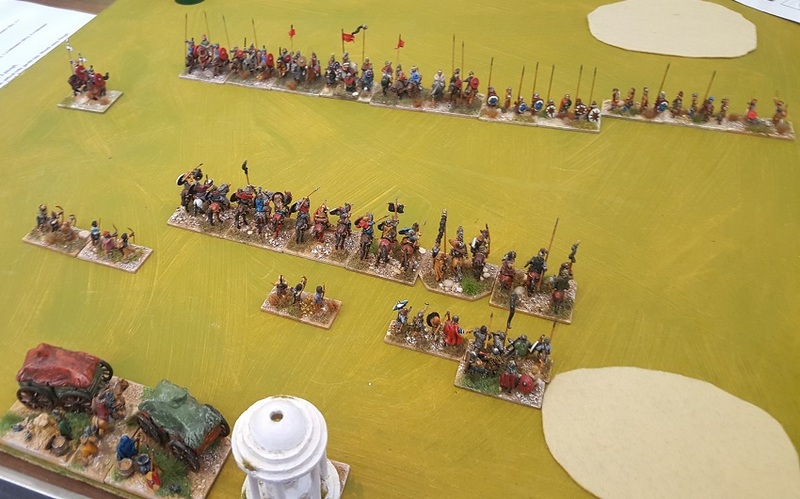 I enquired about the revised interpretation and was told that the new location 'was just another theory' and that 'my game is set up for the traditional battlefield'. Is the evidence compelling, then? We're interested in the green dots. You'll immediately see two things ... they're all down in the bottom left corner (the battlefield). The traditional location (as on the maps above) is middle top. There's nothing up there at all. Second, I've added a red ring where the test track is being built. As you can see, it is right on the edge of the (then) existing archaeology (and since then more dots have been added - and they're down here too) ..
On the right/Eastern side of this area (so, about 1/5th of the way across from the left on the map) it was marsh in the 15th Century. 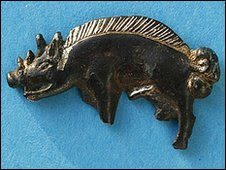 This is where the silver gilt boar badge was found. It is from the period of the battle. It is Richard's personal emblem (probably lost by someone in difficulties in the marsh). 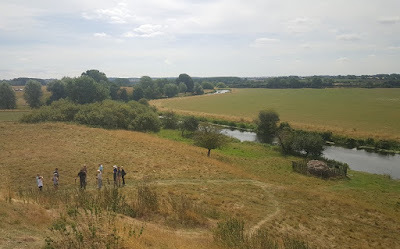 Of course you can add to the archaeology that soil samples show that the marshy ground by Ambion Hill wasn't marsh back in the Medieval period. You can also add, I guess, that the contemporary descriptions don't describe Richard sitting on a hill. 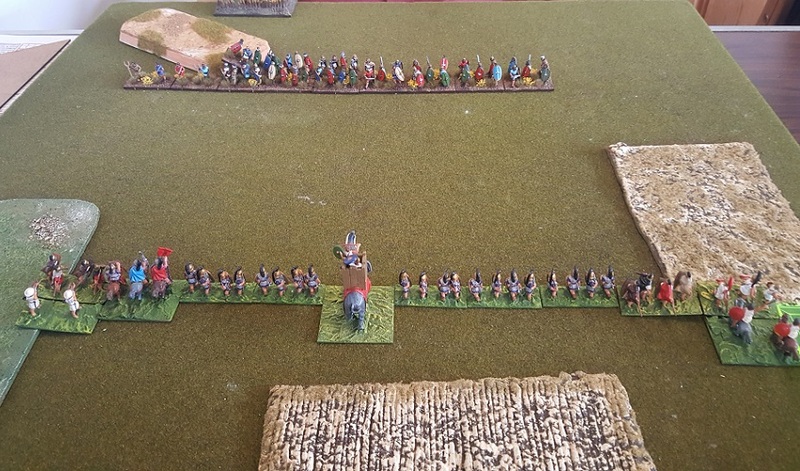 Although we don't have definitive evidence for the orientation of forces (though the shot pattern does give us strong clues) it is clear that the battle was fought along or across Fenn Lane, and that the Ambion Hill tradition is untenable in the light of the archaeology. 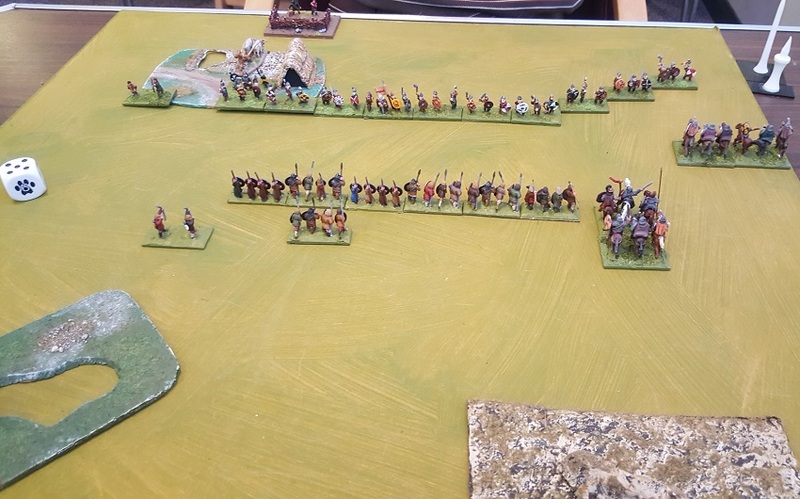 Artillery massed to rake a frontal attack, the French mercenaries attacking from a flank away from the guns (note that logically this would be the flank where the test track is now to be built**). 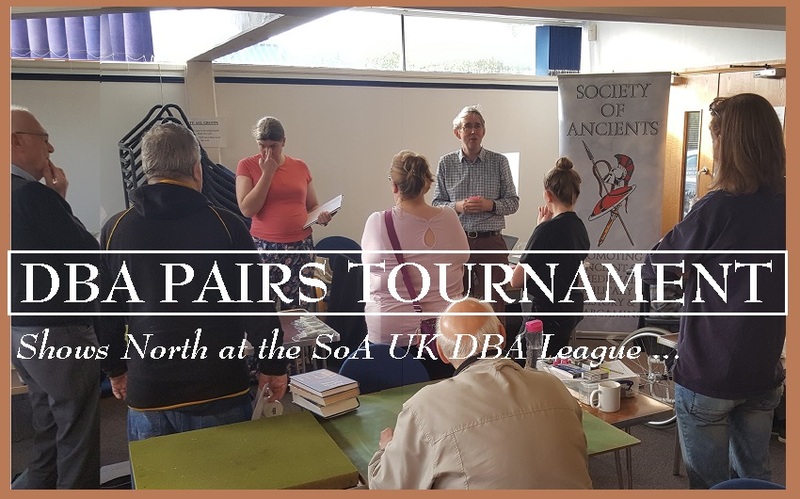 The Society of Ancients has chosen Bosworth for the 2020 BattleDay, so I will be following this post up in due course with some contributions for Slingshot and for the Battle Pack. But for now, I'd like to summarise ... there is no chance at all that this battle was fought on Ambion Hill, and no chance of the traditional accounts being helpful. 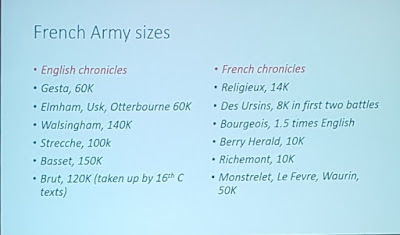 We can now easily identify the location, and going back to the contemporary accounts we can (with more difficulty) piece together anew how it was fought. The location and terrain do make a difference as it entirely drives and gears the narrative. And what happens at the battle is hard-wired into a grander timeline that takes us from the Plantagenet world to the Tudor reformation. 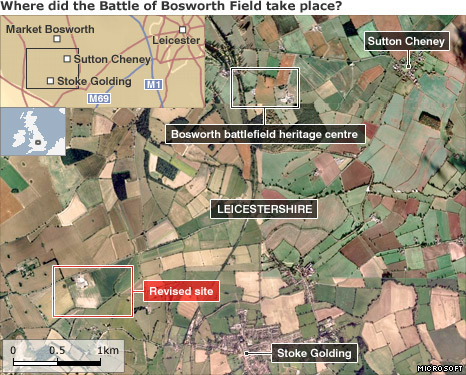 It is very unlikely that the dreadful planning decision at Bosworth can be overturned. It has wider implications. 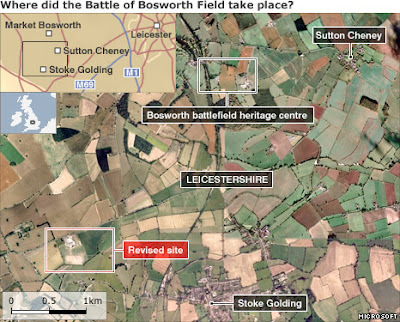 Many have felt that the registering process ('listing' effectively) protects heritage sites like Bosworth. It doesn't. 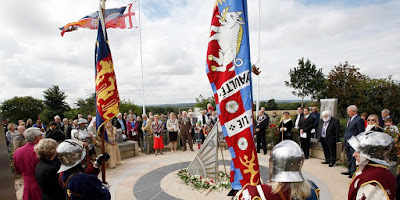 Many more, of course, have felt that even if battlefields weren't absolutely secure, such an important one as Bosworth - one where millions have been invested, one on an international tourist route etc. - would be safe. It wasn't. 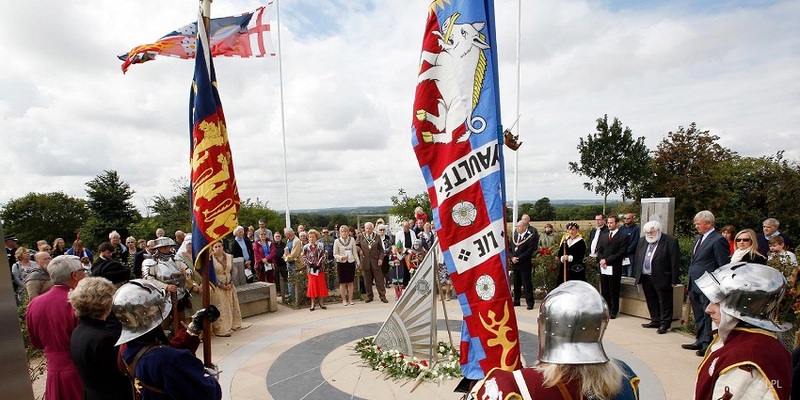 If they can do this at Bosworth, what chance is there to preserve our military heritage at less well-known sites? Statutory protection is now the only answer. That is another thread that will need following up. *Standards are different these days - which actually makes it quite hard to correct these mistakes. 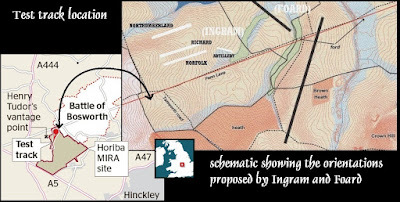 On the rare occasion where Historic England allows the relocation of a misplaced battlefield, the standards of proof required are very high. So moving a battlefield is, in fact, quite rare. It is generally done where it is quite important to establish the location - and you can pretty much bank on the new location (because it it just so hard to persuade HE to make the change). 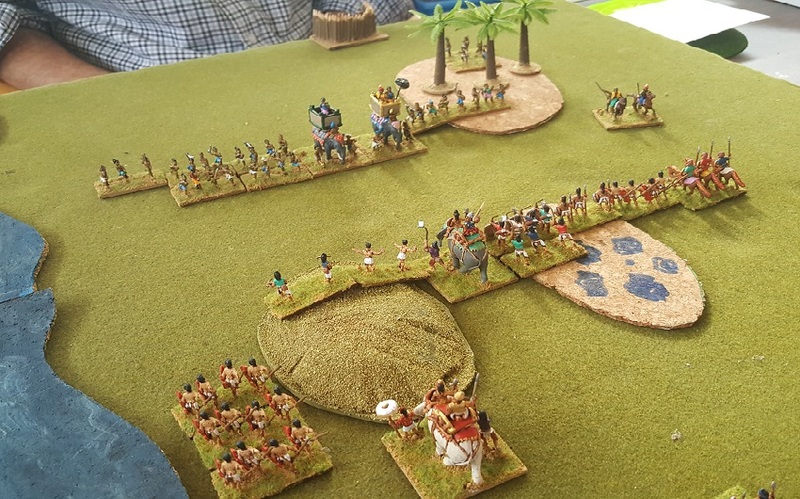 **and note that this French flank attack causes the collapse of Norfolk's division, and the collapse of Norfolk's division is probably what prompts Richard to launch the cavalry attack that decides the battle and seals his fate. So ... really ... we don't want this part of the battlefield developed over and 'off limits' for commercially (and militarily) sensitive testing. 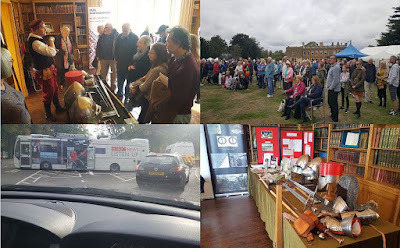 On the Move - whatever happened to October? October looks like a month in which nothing happened around here - but sometimes so much happens it's a challenge for it all to be written down at the time ... or as with some topics, the perspective wasn't clear when the posting might have been done. So here's how I'll catch up. As well as the heritage events posted earlier*, since the Hereward show, either personally or with the Shows North team or the Northampton Battlefields Society, I have led military walks at Kettering Cemetery, Fotheringhay Castle and, out of our period, at Naseby. The Curry talk was fantastic and bang on what the Battlefields Society wanted. Highly recommended if you get the chance to hear her. On a less inspiring note, I was part of the team that tried to firefight the damage the Hinckley-Bosworth planners decided to do to the battlefield at Bosworth - and I had to squeeze in my customary support for the Society of Ancients DBA League ... indeed we have quite a lot of Ancients and of DBA happening. 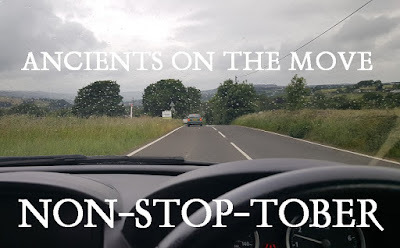 To make sure everything gets properly reported, I'll break this summary up into a series of blogs - but now I have some time at my desk, they'll come (I hope) in quick succession (so the end of the Autumn schedule can resume its proper place). 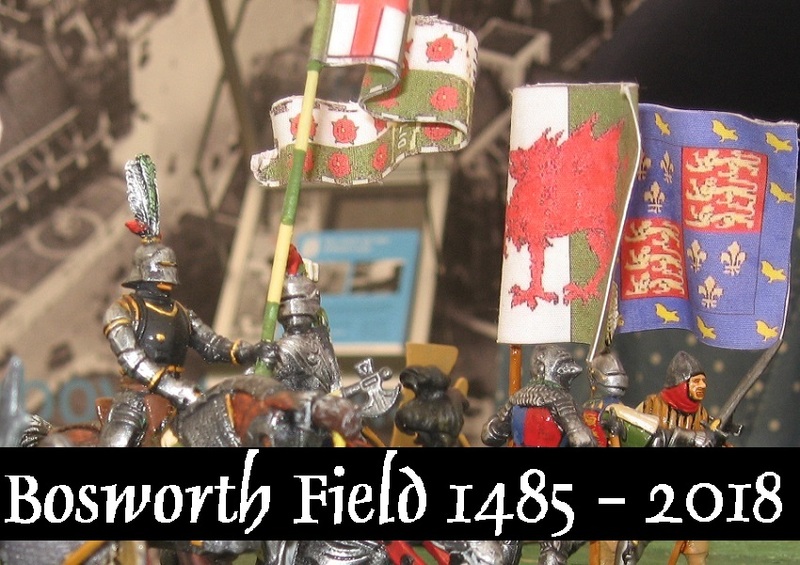 I'll append some words about Bosworth and some shots from our heritage (end of) season. 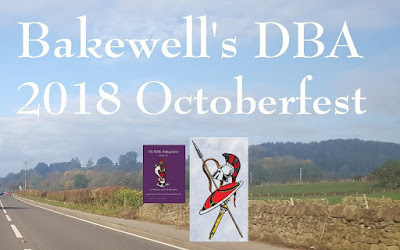 Then I'll do a bit on the historical DBA I put on for our local group. Then the Bakewell and English DBA Open events (which topped off the 2018/18 season). 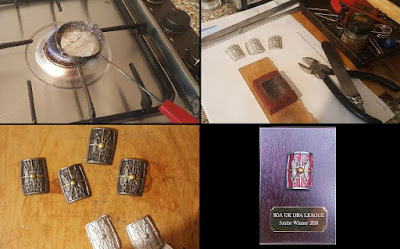 I've collected some pictures together for a special on the Lombards ... and then the DBA stuff can wrap up with Tarrington (up to date and the start of a new League season)! On the home front, I've been helped with the maths ... 6 heritage events or guiding gigs, 9 committee or sub-committee meetings (including 2 AGMs), the 2 trips to Bosworth, 8 local wargame meets and 3 DBA tournaments. 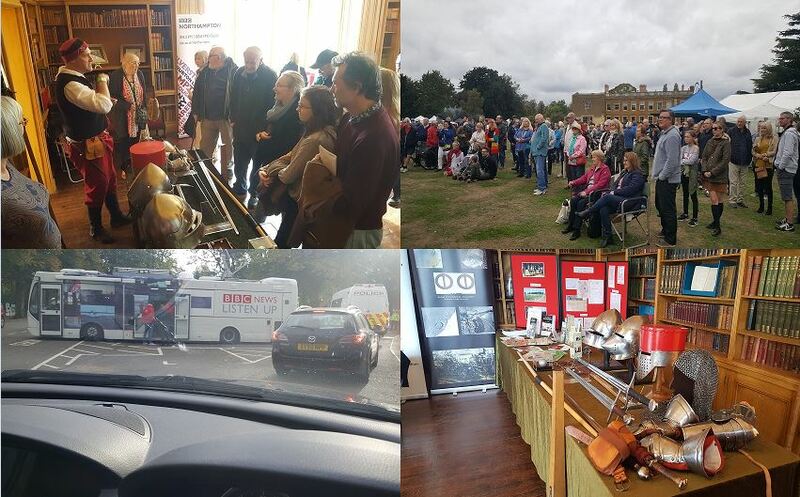 *at the endangered Eleanor Cross (symbol of the Northampton Battlefields Society, from where the prelates watched the battle of Northampton in 1460, and the site where Warwick executed his enemies after the victory at Edgcote nine years later) ... at Becket Park and (BBC Northamptonshire Day) at Delapre Abbey. All in sight of the battlefield.